Contractor Trailer For Sale | T.P. Trailers, Inc. If you’re a landscaper or contractor you may need a heavy-duty contractor trailer designed for commercial use and built with durability in mind. We offer contractor trailers that will work as hard as you do in all types of weather. 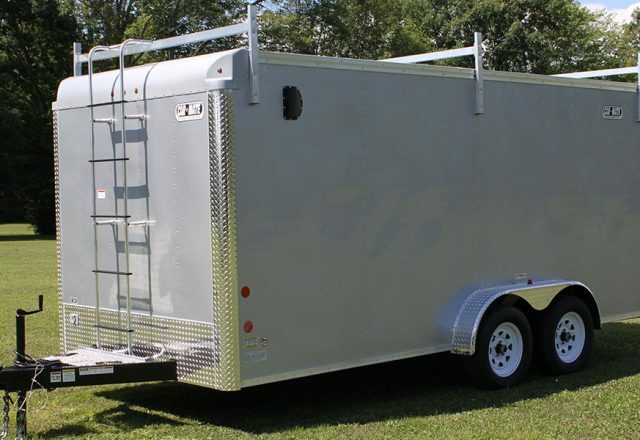 Our enclosed contractor trailers for sale offer different features for all needs. Call us about different options and finding the trailer that works for you. Contractor trailers come in all shapes and sizes. At Car Mate, we understand how important it is to get the one that’s perfect for your needs. Car Mate has many standard features such as 76” to square interior height, a reinforced flat roof, electric, lights & receptacles, front ladder and 3 ladder racks. Options include shelving and aluminum fenders, etc. Check out our impressive selection today and discover the Car Mate difference!